Background and aims The majority of gastrointestinal stromal tumors (GISTs) have KIT mutations; however, epigenetic abnormalities that could conceivably potentiate the aggressiveness of GISTs are largely unidentified. Our aim was to establish epigenetic profiles associated with the malignant transformation of GISTs. Methods Methylation of four tumor suppressor genes, RASSF1A, p16, CDH1, and MGMT was analyzed in GISTs. Additionally, genome-wide DNA methylation profiles were compared between small, malignant-prone, and malignant GISTs using methylated GpG island amplification microarrays (MCAM) in a training set (n=40). Relationships between the methylation status of genes identified by MCAM and clinical features of the disease were tested in a validation set (n=75). 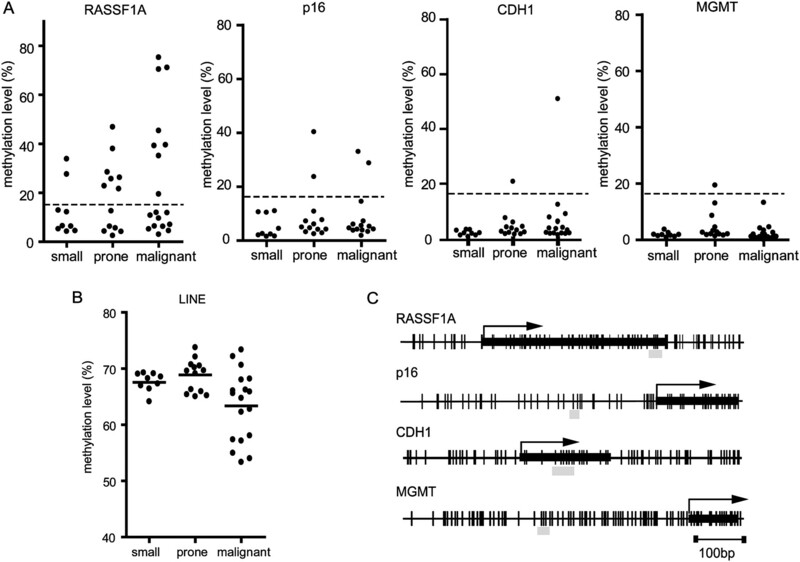 Results Methylation of RASSF1A progressively increased from small to malignant GISTs. p16 was specifically methylated in malignant-prone and malignant GISTs. MCAM analysis showed that more genes were methylated in advanced than in small GISTs (average of 473 genes vs 360 genes, respectively, P=0.012). Interestingly, the methylation profile of malignant GISTs was prominently affected by their location. Two genes, REC8 and PAX3, which were newly-identified via MCAM analysis, were differentially methylated in small and malignant GISTs in the training and validation sets. Patients with methylation of at least REC8, PAX3, or p16 had a significantly poorer prognosis (P=0.034). Conclusion Our results suggest that GIST is not, in epigenetic terms, a uniform disease and that DNA methylation in a set of genes is associated with aggressive clinical behavior and unfavorable prognosis. The genes identified may potentially serve as biomarkers for predicting aggressive GISTs with poor survivability. Approximately 90% of gastrointestinal stromal tumours (GIST) have activating mutations in the KIT gene (∼85%) or platelet-derived growth factor receptor alpha gene (∼5%), which were detected even in small GIST (<10 mm), suggesting that these mutations are early initiation steps in GIST formation. Although two key prognostic features (tumour size and mitotic index) of primary GIST appear to be of use for risk stratification, a persistent problem is that a subset of cases classified as low risk nonetheless occasionally metastasize. Location may also be considered as a factor for the risk assessment of GIST, because a small intestinal GIST is more aggressive than a gastric GIST of equal size. Elucidating the underlying mechanism that potentiates the aggressiveness of GIST is key to facilitating the development of a new strategy for the treatment of malignant GIST. Genome-wide DNA methylation analysis revealed that more genes were methylated in advanced GIST than small GIST, suggesting a link between the accumulation of DNA methylation and disease progression. Among the hypermethylated genes, we identified potent methylation markers, REC8, PAX3 and p16, of which DNA methylation status is significantly correlated with a worse prognosis of GIST. The DNA methylation profile of malignant GIST was prominently affected by its location in the gastrointestinal system; gastric and small-intestinal GIST displayed distinctive DNA methylation profiles, supporting the idea that the anatomical location of GIST affects the clinical significance of the respective disease. Our findings provide a better understanding of the role of aberrant DNA methylation in GIST, and may provide new molecular diagnostic tools for this disease subtype. Examination of three methylation markers could be informative for diagnostic and prognostic assessment of GIST and could be elucidated using samples obtained from minimally invasive procedures, such as biopsy specimens obtained by the endoscopic ultrasound-guided fine-needle aspiration technique. GIST are known to originate from interstitial cells of Cajal (ICC) or their precursors. It has been suggested that the acquisition of KIT and platelet-derived growth factor receptor alpha (PDGFRA) mutations in ICC is a possible early initiation step in GIST tumorigenesis.3 5 6 In addition to KIT and PDGFRA mutations, the majority of GIST also display other genetic abnormalities as they progress to a malignant phenotype.7 One particular study demonstrated that other genetic abnormalities, such as losses of 13q, 10q and 22q, contribute to the progression and malignant transformation of GIST.8 Inactivation of the cell cycle regulators p16 and/or p27 has also been shown to correlate with malignancy in GIST.9 10 However, these genetic abnormalities do not completely explain the underlying mechanisms that potentiate the aggressiveness of this tumour type. Aberrant DNA methylation has been observed in many human malignancies, sometimes correlated with potentiated aggressiveness of the tumour.11 12 As DNA methylation of particular genes is known to be associated with patient outcome, the detection of aberrant DNA methylation in clinical specimens could be a useful biomarker for malignancies.13 14 Recent advances in technologies for high-throughput genome-wide DNA methylation analyses have facilitated epigenetic profiling of human malignancies.15 To investigate epigenetic events in GIST, we performed genome-wide screening for genes with aberrant DNA methylation using a methylated CpG island amplification microarray (MCAM) approach, which provides reproducible results with a high validation rate.16–18 We further evaluated correlations between DNA methylation status and clinicopathological features of GIST including gene mutations. We collected 115 GIST samples in accordance with institutional policy from patients who underwent surgical resection at the Aichi Cancer Center Central Hospital, Nagoya, at the Osaka University Hospital, Osaka, at the Osaka Police Hospital, Osaka, or at Sapporo Medical University Hospital, Sapporo in Japan. Specimens showing a high proportion of tumour cells (>80%) without definite evidence of necrosis were analysed. We divided GIST samples into two sets, a training set (n=40) and a validation set (n=75) without any bias (table 1). GIST were classified into three groups: small GIST (n=33), malignant-prone GIST (n=49), and malignant GIST (n=33), based on the modification of 2002 consensus criteria (low, intermediate and high-risk groups; table 1).3 Small GIST refers to small tumours (≤5 cm) with low mitotic frequency (≤5 mitosis per 50 high-power fields) and without any evidence of metastasis or invasion (low-risk group). Malignant-prone GIST refers to larger tumours (>5 cm) or those with more than five mitoses per 50 high-power fields and without any evidence of metastasis or invasion (intermediate and high-risk groups). Malignant GIST refers to tumours from patients with a history of metastasis or invasion. Metastatic disease has been diagnosed using imaging studies and clinical analysis when primary tumours were surgically treated. Patients in the training set and in the validation set had similar features, except more patients in the validation cohort were classified as having malignant-prone GIST (table 1). We also collected 18 muscle layers from six stomachs, six small intestines and six colons. Samples and clinical data were collected after the approval of the institutional review board of Aichi Cancer Center was received and written informed consent had been obtained from all patients. ICC were identified as c-Kit-positive cells among the intestinal cells. A higher density of ICC is observed at the level of the myenteric plexus between circular and longitudinal muscle layers in the small intestine.19 To obtain ICC as a normal counterpart of GIST cells, we prepared serial sections (10 μm thick), one of which was stained with anti-c-Kit (A4502; DAKO, Glostrup, Denmark) as an indicator, and we carefully dissected an unstained section under stereoscopic microscope observation (see supplementary figure 1, available online only). We performed bisulfite treatment on genomic DNA as previously described.18 DNA methylation levels were measured by a quantitative method using pyrosequencing technology (Pyrosequencing AB, Uppsala, Sweden). A detailed pyrosequencing protocol was described previously18 20 and was used here. The methylation levels at different CpG sites, as measured by pyrosequencing, were averaged to represent the degree of methylation in each sample for each gene. Genes with methylation levels greater than 15% were considered methylation positive, because lower values could not be easily distinguished from background.18 Primer sequences are summarised in supplementary table 1, available online only. Forty GIST of the training set (average age 60.2 years, range 37–81 years) were analysed using MCAM technology. This panel consisted of nine small GIST, 13 malignant-prone GIST and 18 malignant GIST. A detailed protocol for MCAM analysis was described previously18 and was used here. Briefly, amplicons from individual GIST were labelled with Cy5 dye and cohybridised against amplicons from normal controls labelled with Cy3 dye on 15K custom-promoter microarrays from Agilent Technologies (G4497A; Agilent Technologies, Santa Clara, California, USA) containing 6157 unique genes, which we had initially validated in a previous study.18 In the present study, eight randomly selected genes (LIMD1, NME1, RASSF1A, IGF2BP1, REC8, PAX3, MGMT and NR2E1) from the MCAM analysis were subsequently assessed by pyrosequencing analysis of GIST samples. A good concordance was observed between the methylation status by MCAM (a signal ratio >2.0 in MCAM considered methylation positive) and pyrosequencing analyses (specificity, 80%; sensitivity, 74%, data not shown) as was also demonstrated in previous studies.16 21 We thus considered a signal ratio greater than 2.0 in MCAM as methylation positive. The data of our microarray are available in the Array express (http://www.ebi.ac.uk/arrayexpress) with accession codes: E-TABM-1022. Mutations in the KIT (exons 9, 11, 13 and 17) and PDGFRA (exons 12, 14 and 18) genes were determined by direct sequencing. All sequencing reactions were carried out in forward and reverse direction. Primer sequences are summarised in supplementary table 1 (available online only). Homozygous deletions were identified by real-time PCR using primers within the p16 and GAPDH loci (supplementary table 1, available online only). Samples that displayed a relative ratio of p16:GAPDH less than 0.1 were defined has having a homozygous deletion. Total RNA was isolated using TRIzol (Invitrogen, Carlsbad, CA, USA). Two micrograms of RNA was reverse transcribed with MPMLV (Promega, Madison, Wisconsin, USA). Reverse transcription PCR was carried out in triplicate for the target genes (Applied Biosystems, Carlsbad, CA, USA). Primer sequences are shown in supplementary table 1 (available online only). All statistical analyses were performed using JMP statistical software version 5.1. Fisher's exact test was used to determine non-random associations between two categorical variables. Kruskal–Wallis analysis was used to evaluate the extent of differences among more than three groups. All reported p values are two sided, with p<0.05 taken as statistically significant. Patients were followed until incidence of death or until September in 2010, whichever came first. Survival information was available for 69 of the 115 cases. Overall survival was calculated from the date of diagnosis until the date of death or the date the patient was last known to be alive (censored). Median follow-up times are 24.5 months. Overall survival curves were generated using the Kaplan–Meier method, and the log-rank test was used for statistical analysis. A multivariate analysis using the Cox proportional hazards model was performed to estimate the HR. All variables for the multivariate analysis were categorical variables. The factors considered in the multivariate model included tumour origin, prognosis marker and mitotic index, which were marginally significant (p<0.1) or statistically significant (p<0.05) by univariate Cox regression analysis, in addition to tumour size. First, we examined mutations in the KIT and PDGFRA genes in the training set, finding that 36 of 40 (90%) GIST harbour mutations at one or other of these loci (see supplementary table 2, available online only). The majority of mutations were found in exon 9 (five GIST, 13%) and exon 11 (28 GIST, 70%) of the KIT gene, the frequency of which is similar to that observed in previous studies.22 There was no correlation between the type of mutation and frequencies of disease recurrence or metastasis (data not shown). Next, we examined the DNA methylation status of four tumour suppressor genes, p16, RASSF1A, O-6-methylguanine-DNA methyltransferase (MGMT) and E-cadherin (CDH1) (figure 1 and supplementary table 3, available online only) in 40 GIST. The methylation status of the examined regions of p16, RASSF1A and MGMT correlated well with gene expression, although they were not within nucleosome-free regions.23 24 A lower level of DNA methylation of RASSF1A was found in small GIST and increased progressively from small to malignant GIST. p16 was specifically methylated in malignant-prone and malignant GIST. DNA methylation was less frequently found in MGMT and CDH1 compared with RASSF1A and p16. These data suggest that DNA methylation of RASSF1A is an early event in tumorigenesis and evolves progressively, while p16 methylation was a specific event associated with more advanced (malignant-prone and malignant) GIST (figure 1 and supplementary table 3, available online only). While aberrant hypermethylation of the gene promoters has been demonstrated in tumours, methylation of the LINE-1 gene, an indicator of global methylation status, has been shown to be inversely associated with tumour transformation.11 25 26 Our analysis showed that LINE-1 methylation was decreased in malignant GIST (63.4±6.1%) compared with malignant-prone GIST (68.8±3.1%) and small GIST (67.6±1.8%; p=0.02). These results raise the possibility that genome-wide DNA methylation profiles are different between small, malignant-prone and malignant GIST, which may reflect the clinicopathological differences between these tumour types. To examine this possibility, we conducted genome-wide DNA methylation analysis in small, malignant-prone and malignant GIST. DNA methylation status of the candidate genes p16, RASSF1A, CDH1, MGMT (A) and LINE-1 repetitive elements (B) in gastrointestinal stromal tumours (GIST). Levels of methylation were measured by bisulfite-pyrosequencing analysis in small, malignant-prone (prone), and malignant GIST. The Y-axis indicates the level of DNA methylation of each gene. Dots represent the methylation level of the indicated gene within individual samples. Broken lines indicate a methylation level of 15%. Genes with methylation levels greater than 15% were considered methylation positive. (C) Diagrams of promoters of the RASSF1A, p16, CDH1 and MGMT. Each vertical line represents a single CpG site. The transcription start site (arrow) and the location of exon1 (black box) are indicated. Thick grey bars denote the regions analysed by pyrosequencing. MCAM analysis was performed on 40 GIST. We selected these samples based on both the quality and quantity of DNA available for this type of analysis. The characteristics of the samples used are shown in supplementary table 2 (available online only). Dissected muscle tissue served as a normal control. As ICC in gastrointestinal muscles are thought to be the cell of origin for GIST, it would be appropriate to use them as a normal counterpart for the study. However, our preliminary experiments showed that DNA from microscopic dissection did not yield stable results in MCAM analysis; it might be due to the quality of DNA (see supplementary figure 1, available online only, data not shown). To evaluate differences in DNA methylation status of the candidate loci between microscopically dissected ICC and normal muscle layer tissues, we examined DNA methylation levels of 16 genes and LINE-1 in these two tissues (see supplementary table 4, available online only). The DNA methylation levels of these genes as well as LINE-1 were found to be identical in these two tissues. Therefore, we used normal muscle layers as a control in this study, although we still cannot exclude the possibility that DNA methylation in some genes is not identical between these two tissues based on the analysis of this limited set of genes. The number of methylated genes identified was not significantly associated with any other clinicopathological factors apart from clinical classification (see supplementary table 2, available online only and figure 2A). More genes were methylated in malignant-prone and malignant GIST than small GIST (473 genes±182 genes vs 360 genes±82 genes, p=0.012, figure 2A). This is also true when the number of methylated genes was compared between small and malignant-prone GIST (360 genes±82 genes vs 462 genes±139 genes, p=0.043). These data indicate that clear differences exist with respect to methylation profiles between small GIST and more advanced GIST. Methylated CpG island amplification microarrays (MCAM) analysis in gastrointestinal stromal tumours (GIST). (A) Box and whisker plots of the number of methylated genes in small GIST, as well as advanced GIST (malignant-prone and malignant GIST). The mean is marked by a horizontal line inside the box whose ends denote the upper and lower quartiles. Error bars represent 5th and 95th percentile values, *p=0.012. (B) Heat-map overview of 766 genes, which are commonly methylated in more than 30% of the cases in either small GIST, malignant-prone GIST or malignant GIST (left). Venn diagram of this set of 766 genes showing the relationship of methylation target genes in the three classified groups (right). A number of genes were specifically methylated in advanced GIST; malignant-prone GIST (172 genes) and malignant GIST (155 genes, highlighted in blue). 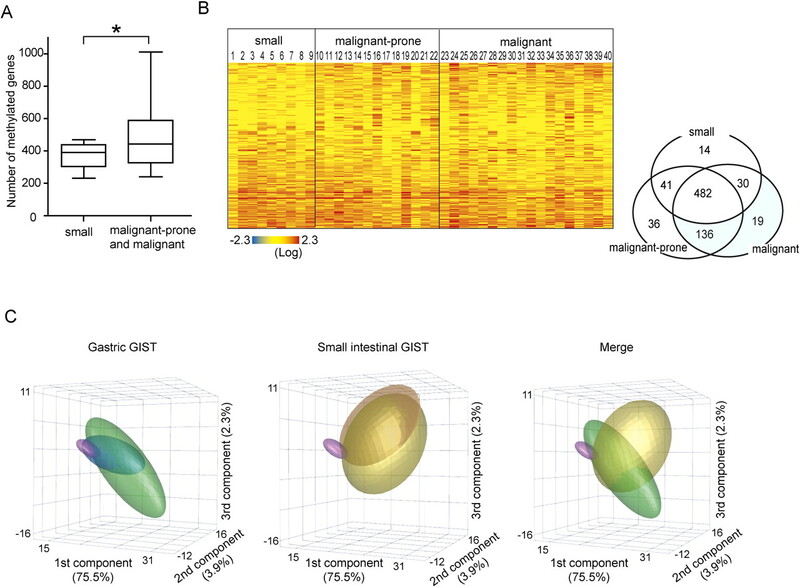 (C) Principal components analysis of the 155 genes associated with gastric GIST (left) and small intestinal GIST (middle), along with merged image of gastric malignant GIST and small intestinal malignant GIST (right). The first three principal components accounted for 81.7% of the total variance. Ellipsoids of standard deviations (75% probability) are drawn with respect to each group. Magenta, small GIST; deep green, malignant-prone GIST from stomach; green, malignant GIST from stomach; orange, malignant-prone GIST from small intestine; yellow, malignant GIST from small intestine. We next analysed to what degree the DNA methylation target genes identified in small, malignant-prone and malignant GIST overlapped with each other. A heat-map overview of 766 methylated genes, which were commonly methylated in more than 30% of the cases in any of the three groups, showed that the majority of DNA methylation target genes in small GIST appeared to be methylated in malignant-prone GIST and/or malignant GIST (figure 2B). Schematic representation of these data in a Venn diagram showed that, although the majority of DNA methylation target genes (482 genes) were commonly methylated in small, malignant-prone and malignant GIST, a number of genes were specifically methylated in malignant-prone GIST and/or malignant GIST (172 genes and 155 genes in malignant-prone and malignant GIST, respectively; 136 genes commonly methylated in both malignant-prone and malignant GIST; figure 2B). These data suggest that DNA methylation in a subset of genes occurs progressively during the malignant process in GIST. DNA methylation profiling identifies clinically or biologically distinct subgroups of cancers. Recent studies of aberrant DNA methylation in human cancers demonstrated high rates of aberrant promoter methylation in a subset of cancers, termed the CpG island methylator phenotype.27 28 The number of methylated genes in malignant-prone GIST and malignant GIST showed the existence of a bimodal distribution pattern of methylation; three GIST were extensively methylated, as demonstrated previously in CpG island methylator phenotype-positive tumours29 (see supplementary figure 2, available online only). These three cases were all malignant GIST; however, no other characteristic features were identified in these cases. DNA methylation has been proposed as a diagnostic and/or prognostic marker for malignancies.14 We next investigated whether DNA methylation status could be a prognostic marker for GIST. We examined the MCAM data relating to the above-mentioned set of 155 genes using a statistical model based on recursive descent partition analysis in order to distinguish the malignant GIST from small GIST (figure 3A, supplementary figure 3, available online only).31 In the training set, two genes, REC8 and paired box 3 (PAX3), were found to be potent markers for identifying the malignant GIST (see supplementary figure 3, available online only). Of the 27 cases in the training set (malignant GIST, n=18; small GIST, n=9), 17/18 (94%) of malignant GIST were methylation positive (signal intensity of GIST/control >2.0 by MCAM) in either of the two genes, while eight out of nine (89%) small GIST were methylation negative (signal intensity of GIST/control ≤2.0 by MCAM) in both of the two genes (see supplementary figure 3, available online only and figure 3A). The methylation status of these two genes in the 40 GIST was confirmed by pyrosequencing analysis. The REC8 and PAX3 genes were found to be significantly more methylated in malignant GIST compared with small GIST (p=0.003 and p=0.026, respectively). A subset of malignant-prone GIST also showed substantial DNA methylation of these two genes (figure 3B and supplementary table 3, available online only). Interestingly, neither of these genes was observed to be expressed in the normal muscle layer, without evidence of substantial DNA methylation (see supplementary figure 4, available online only). Identification of diagnostic and prognostic markers for advanced gastrointestinal stromal tumours (GIST). (A) REC8 and PAX3 are effective markers to distinguish malignant from small GIST on the basis of methylated CpG island amplification microarrays (MCAM) data in the training set (see supplementary figure 3, available online only). (B) DNA methylation status of REC8 and PAX3 in the test set (n=40) (nine small GIST, 13 malignant-prone GIST and 18 malignant GIST). The format of the scatter plot is the same as figure 1. Broken lines indicate a methylation level of 15%. (C), (D) Methylation frequencies of GIST patients. Each column represents the methylation status of three genes of interest, namely REC8, PAX3 and p16, within individual GIST, either small, malignant-prone or malignant. Black boxes denote methylation positive, whereas white boxes indicate no evidence of methylation. Homozygous deletions (HD) were detected, on occasion at the p16 locus (C), in the test set (n=40) and (D) in the validation set (n=75). (E) Kaplan–Meier analysis of overall survival in cases of GIST with and without DNA methylation in at least one of the REC8, PAX3 or p16 genes. Broken and solid lines indicate GIST without (n=32) and with methylation (n=37), respectively (p=0.034). Although our statistical model showed that REC8 and PAX3 might be potent markers for the prediction of malignant GIST, we added p16 to further analyses, because we found that methylation of this gene was also specific to advanced GIST (figure 1 and supplementary table 3, available online only). Indeed, a relationship between genetic alterations or DNA methylation of p16 and the prognosis of GIST has been suggested previously.32 33 The frequency of aberrant DNA methylation in at least one of the three markers (REC8, PAX3 or p16) was found to be one out of nine (11%), five out of 13(38%) and 15/18 (83%) in small, malignant-prone and malignant GIST, respectively (figure 3C). The relationships between clinical stratifications and the three putative prognostic markers, REC8, PAX3 and p16, were independently confirmed in the validation set. The sample in the training set provided adequate statistical power (96.4%) to detect a between-groups difference (ie, DNA methylation frequencies of the three genes were one out of nine (11%) and 15/18 (83%) in small GIST and malignant GIST, respectively; α=0.05 for two-sided test). Consequently, we calculated the sample size of the validation set necessary to detect a between-groups difference as was found in the training set. Our assumptions were a statistical power of 0.9, an α level of 0.05 for a two-sided test and a similar proportion of the malignant GIST group and the small GIST group to the training set. According to these assumptions, the calculated results indicated that we required a minimum of eight, 12 and 16 cases of the small GIST, the malignant-prone GIST and the malignant GIST, respectively. Our validation set (n=75) fulfils these criteria and provided statistical power of 99.8% to detect the between-groups difference (α=0.05 for two-sided test). We investigated the methylation status of these three markers by pyrosequencing analysis. DNA methylation of the three markers in small, malignant-prone and malignant GIST in the validation set progressively increased from small to malignant GIST (8%, 69% and 80% in small, malignant-prone and malignant GIST, respectively, as shown in figure 3D and supplementary table 5, available online only). The methylation status of these three markers could effectively distinguish malignant and small GIST in the validation set (sensitivity 80%; specificity 92%; positive predictive value 86%; negative predictive value 88%), confirming the validity of these markers. Malignant-prone GIST in our classification consist of two risk groups,3 namely intermediate and high risk (table 1). Intriguingly, in the validation set, the frequency of aberrant DNA methylation in at least one of the three markers in the high-risk group (19/24, 79%) was higher than in the intermediate-risk group (six out of 12, 50%, p=0.125). This trend is significant in the total 115 GIST cohort (nine out of 21, 43% in the intermediate-risk group vs 21/28, 75% in the high-risk group, p=0.038). The methylation status of the three markers could effectively distinguish malignant and small GIST in the total cohort of 115 samples (sensitivity 82%; specificity 91%; positive predictive value 90%; negative predictive value 83%). As p16 was identified using different methods, we evaluated whether adding p16 to the two markers (REC8 and PAX3) was advantageous for the prediction of malignant GIST. Specificity, sensitivity, positive predictive value and negative predictive value for the prediction of malignant GIST determined by the three markers including p16 were identical with those determined by REC8 and PAX3 in both the training and validation sets (figure 3C,D). However, the frequency of DNA methylation in at least one of the three markers was higher than that in either REC8 or PAX3 in the high-risk group GIST, which may have a high chance of progression to malignant GIST (21/28, 75% vs 19/28, 67%; figure 3C,D). In addition, DNA methylation of p16 was only found in the high-risk group or malignant GIST. Therefore, aberrant DNA methylation of the three markers including p16 was significantly associated with clinical classification in both the training set and the validation set (table 2). To investigate whether the status of DNA methylation in these three markers impacts on overall survival, Kaplan–Meier survival analysis was performed in 69 patients from either training set or validation set whose survival information was available. Log-rank tests revealed that patients with GIST displaying no methylation (n=32) survived significantly longer than those with at least one gene methylated (n=37; p=0.034) (figure 3E). We evaluated the statistical power for the survival analysis comparing survival rate at the median follow-up time of the groups with and without methylation (76.1%, n=37 and 96.6%, n=32) and found that our sample provided 74.4% statistical power (one-sided, 5% log-rank test). Using univariate Cox regression analysis, overall survival was correlated with tumour origin, methylation status of the three markers and mitotic index (p=0.004, p=0.024 and p=0.029, respectively; table 3). In addition to tumour size, these factors were entered into the multivariate Cox regression analysis, proving to be valid as independent prognostic factors in predicting overall survival. Tumour origin and methylation status were defined as independent prognostic factors in this analysis (HR 5.045, p=0.003 and 4.579, p=0.042, respectively). It has been suggested that small-intestinal/rectal GIST are more aggressive than gastric GIST of equal size.1 We also performed univariate and multivariate Cox regression analyses using different size criteria for the categorical values of small-intestinal/rectal GIST (≥2 cm) and gastric GIST (≥5 cm) (see supplementary table 6, available online only). This analysis also defined tumour origin and methylation status as independent prognostic factors (HR 7.414, p=0.003 and 5.990, p=0.023, respectively). We found that DNA methylation accumulates genome wide during GIST progression. This finding was also supported by data reflecting the overall global DNA methylation status, showing that aberrant LINE-1 methylation was most apparent in malignant GIST as was also reported very recently by others.26 In contrast to all the small GIST, which showed less DNA methylation than malignant GIST, a subset of malignant-prone GIST shows a similar methylation profile to that displayed by malignant GIST. The outcome of these malignant-prone GIST is now under investigation; indeed, planned longer-term observation will reveal whether such malignant-prone GIST displaying frequent evidence of DNA methylation may progress to invasive or metastatic GIST. The anatomical location of GIST has been reported to affect the clinical outcome of this tumour. Small intestinal GIST are known to be more aggressive than gastric GIST of equal size, with this being factored into the risk assessment of a primary tumour.1 In the current study, principal components analysis showed that the DNA methylation profiles of gastric and small intestinal GIST were consistently different. In addition, multivariate Cox regression analysis proved tumour location to be an independent prognostic factor. Taken together, these data suggest that GIST represent a family of closely related but distinct tumour subtypes, rather than a single pathological entity,36 in which characteristic targets are epigenetically regulated and, therefore, may show different clinical outcomes. In addition to the pathogenic implications, DNA methylation profiles represent a chemically and biologically stable source of molecular diagnostic information. Recent technology has been developed to perform genome-wide screening for altered DNA methylation profiles, which can identify new candidate biomarkers for use in diagnosis and determining prognosis.13 14 In the current study, we identified three potent methylation-based markers, namely REC8 and PAX3 from MCAM analysis and p16 from pyrosequencing analysis. PAX3 is a member of the paired box family of transcription factors.37 REC8, a key component of the meiotic cohesion complex, limits synapsis between homologous chromosomes during meiosis.38 The methylation status of these three markers could effectively distinguish malignant and small GIST. In addition, the methylation status of GIST is closely associated with prognosis. Therefore, we propose here that the methylation status of these markers may potentially serve as a biomarker predicting aggressive GIST with poor survivability. Notably, the negative predictive value in the total cases is 83%, suggesting that 17% of the GIST patients who are diagnosed as being negative based on these three markers actually have malignant potential. Validation studies of the relevance of these methylation marker genes using larger independent cohorts is necessary for a further evaluation of their promise as diagnostic and prognostic markers for malignant GIST. Nevertheless, a multidisciplinary effort is desired to elucidate better ways to overcome the current limitations of prediction for malignant GIST. The authors would like to thank Ikuko Tomimatsu for her technical assistance and Shana Straub for her critical reading of the manuscript.
. NCCN Task Force report: Management of patients with gastrointestinal stromal tumor (GIST)–update of the NCCN clinical practice guidelines. J Natl Compr Canc Netw 2007;5(Suppl 2):S1–29; quiz S30.
. Adjuvant imatinib mesylate after resection of localised, primary gastrointestinal stromal tumour: a randomised, double-blind, placebo-controlled trial. Lancet 2009;373:1097–104.
. Diagnosis of gastrointestinal stromal tumors: a consensus approach. Hum Pathol 2002;33:459–65.
. Gastrointestinal stromal tumors of the stomach: a clinicopathologic, immunohistochemical, and molecular genetic study of 1765 cases with long-term follow-up. Am J Surg Pathol 2005;29:52–68.
. A novel gain-of-function mutation of c-kit gene in gastrointestinal stromal tumors. Gastroenterology 1998;115:1090–5.
. PDGFRA activating mutations in gastrointestinal stromal tumors. Science 2003;299:708–10.
. Gastrointestinal stromal tumors. Virchows Arch 2010;456:111–27.
. Biological significance of chromosomal imbalance aberrations in gastrointestinal stromal tumors. J Biomed Sci 2004;11:65–71.
. High prognostic value of p16INK4 alterations in gastrointestinal stromal tumors. J Clin Oncol 2003;21:1688–97.
. 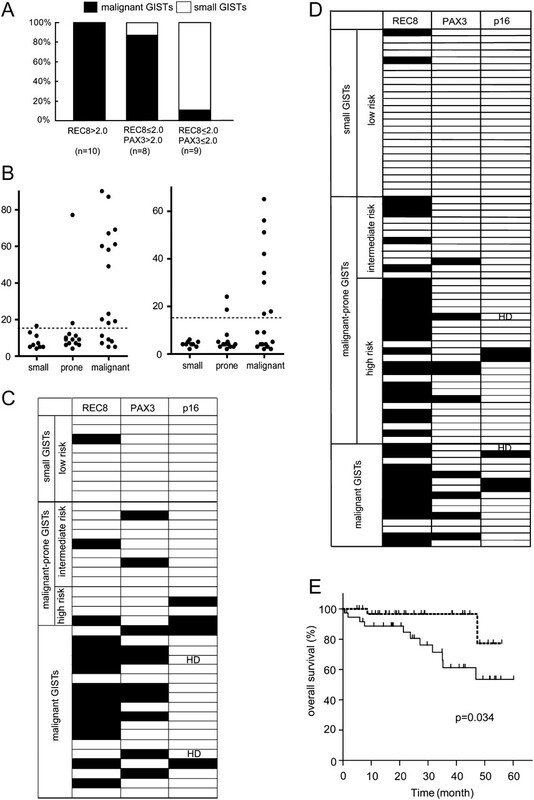 Correlation of enhanced cell turnover with prognosis of gastrointestinal stromal tumors of the stomach: relevance of cellularity and p27kip1. Pathol Int 2006;56:724–31.
. The fundamental role of epigenetic events in cancer. Nat Rev Genet 2002;3:415–28.
. Cancer epigenomics: implications of DNA methylation in personalized cancer therapy. Cancer Sci 2009;100:787–91.
. The power and the promise of DNA methylation markers. Nat Rev Cancer 2003;3:253–66.
. Detection and interpretation of altered methylation patterns in cancer cells. Nat Rev Cancer 2005;5:223–31.
. Principles and challenges of genome-wide DNA methylation analysis. Nat Rev Genet 2010;11:191–203.
. Genome-wide profiling of DNA methylation reveals a class of normally methylated CpG island promoters. PLoS Genet 2007;3:2023–36.
. Genome-wide profiling of methylated promoters in pancreatic adenocarcinoma. Cancer Biol Ther 2008;7:1146–56.
. Epigenetic profiles distinguish malignant pleural mesothelioma from lung adenocarcinoma. Cancer Res 2009;69:9073–82.
. c-Kit immunoreactive interstitial cells in the human gastrointestinal tract. J Auton Nerv Syst 1999;75:38–50.
. Sensitive and quantitative universal pyrosequencing methylation analysis of CpG sites. Biotechniques 2003;35:146–50.
. Variable DNA methylation patterns associated with progression of disease in hepatocellular carcinomas. Carcinogenesis 2008;29:1901–10.
. Kinase mutations and imatinib response in patients with metastatic gastrointestinal stromal tumor. J Clin Oncol 2003;21:4342–9.
. Alterations of DNA methylation and histone modifications contribute to gene silencing in hepatocellular carcinomas. Hepatol Res 2007;37:974–83.
. MGMT promoter methylation and field defect in sporadic colorectal cancer. J Natl Cancer Inst 2005;97:1330–8.
. A simple method for estimating global DNA methylation using bisulfite PCR of repetitive DNA elements. Nucleic Acids Res 2004;32:e38.
. A novel correlation between LINE-1 hypomethylation and the malignancy of gastrointestinal stromal tumors. Clin Cancer Res 2010;16:5114–23.
. CpG island methylator phenotype in colorectal cancer. Proc Natl Acad Sci U S A 1999;96:8681–6.
. Identification of a CpG island methylator phenotype that defines a distinct subgroup of glioma. Cancer Cell 2010;17:510–22.
. CpG island methylator phenotype (CIMP) of colorectal cancer is best characterised by quantitative DNA methylation analysis and prospective cohort studies. Gut 2006;55:1000–6.
. A multivariate two-sample test based on the number of nearest neighbor type coincidences. Ann Statist 1988;16:772–83.
. Selection of potential markers for epithelial ovarian cancer with gene expression arrays and recursive descent partition analysis. Clin Cancer Res 2004;10:3291–300.
. Role of p16/INK4a in gastrointestinal stromal tumor progression. Am J Clin Pathol 2004;122:35–43.
. Loss of p16 protein defines high-risk patients with gastrointestinal stromal tumors: a tissue microarray study. Clin Cancer Res 2005;11:638–45.
. Tumor suppressor gene hypermethylation as a predictor of gastric stromal tumor behavior. J Gastrointest Surg 2003;7:1004–14; discussion 14.
. Aberrant methylation status of known methylation-sensitive CpG islands in gastrointestinal stromal tumors without any correlation to the state of c-kit and PDGFRA gene mutations and their malignancy. Cancer Sci 2008;99:253–9.
. Assessing the prognosis of gastrointestinal stromal tumors: a growing role for molecular testing. Am J Clin Pathol 2004;122:11–13.
. Conservation of the paired domain in metazoans and its structure in three isolated human genes. EMBO J 1989;8:1183–90.
. Absence of mouse REC8 cohesin promotes synapsis of sister chromatids in meiosis. Dev Cell 2005;8:949–61.
. Evidence for an instructive mechanism of de novo methylation in cancer cells. Nat Genet 2006;38:149–53.
. Linking DNA methylation and histone modification: patterns and paradigms. Nat Rev Genet 2009;10:295–304.
. A chromatin landmark and transcription initiation at most promoters in human cells. Cell 2007;130:77–88.
. The presence of RNA polymerase II, active or stalled, predicts epigenetic fate of promoter CpG islands. Genome Res 2009;19:1974–82.
. Epigenetic regulation of gene expression: how the genome integrates intrinsic and environmental signals. Nat Genet 2003;33(Suppl):245–54.
. High-resolution mapping of DNA hypermethylation and hypomethylation in lung cancer. Proc Natl Acad Sci U S A 2008;105:252–7.
. Association between frequent CpG island methylation and HER2 amplification in human breast cancers. Carcinogenesis 2009;30:466–71.
. Detection of lymph node micrometastases by gene promoter hypermethylation in samples obtained by endosonography—guided fine-needle aspiration biopsy. Clin Cancer Res 2004;10:4444–9. Funding This work is supported by grants-in-aid for cancer research from the Ministry of Health, Labour and Welfare and a grant from the Japan Society for the Promotion of Science. Competing interests None to declare. Ethics approval This study was conducted with the approval of the Aichi Cancer Center Review Board.